While General Donald McLeod headed off to invade Windsor, the other Patriot leaders traveled by coach to upstate New York to carry out their Eagle Tavern battle plan. William Lyon Mackenzie, Rensselaer Van Rensselaer, and Daniel Heustis stopped in Watertown. Bill Johnston continued on to Clayton. Together, they began to build an army of invasion with stunning ease. The campaign to recruit and provision a Patriot army was never a secret affair. Printed flyers circulated through the upstate New York counties calling on Patriot supports to contribute to the cause. Sleighs, provisions, clothing, and money poured in. In towns and cities throughout Jefferson, Oswego and Onondaga Counties, companies of citizen soldiers gelled around community leaders and began to train for battle. For weapons, Bill Johnston and other Patriot leaders simply stole an estimated 4,000 rifles and five field cannon from militia arsenals in Watertown, Batavia and Elizabethtown, often with the guards turning a blind eye. Placed in sleighs, the weapons, powder and shot moved north, some to Clayton and some across the river to the countryside surrounding Kingston. Mackenzie and Johnston used their connections in Upper Canada to build a secret Canadian army. In the Midlands District—the counties surrounding Kingston—hundreds of disgruntled farmers, men angry at the unequal and authoritarian rule of the Family Compact, accepted arms and agreed to use them when summoned. Though there is no historical paper trail to prove it, Bill Johnston most likely handed the smuggling of arms to the Midlands. For 25 years, he'd successfully smuggled tea to Upper Canada. His contacts were often farmers, who then moved the tea to market in hay wagons or sleighs. It was a small matter to substitute weapons and ammunition. So well were the weapons smuggled that Lt.-Colonel Richard Bonnycastle, Fort Henry's commandant, later wrote: "The introduction of arms and ammunition into Canada for the use of the rebels was so well devised and executed, that but little of either was ever discovered." Under Johnston's plan, the American army would assemble in Clayton and move toward Gananoque to draw the British regulars and main militia units from the fort, and once victorious, this army would march on Kingston from the east. His army of farmers was to travel to Kingston in small groups, on the pretext of going to market, and lodge in inns and public houses. Once the fort emptied, this army would set fires in key areas of Kingston and then attack the fort. 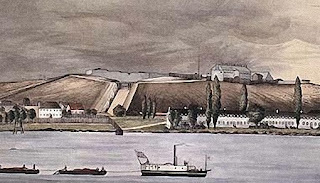 Under Bill Johnston's direction, a few men joined the British militia stationed at Fort Henry in Kingston. When the attack on the fort began, it was their job to open the gates. One man with blacksmith experience had agreed to spike the cannon and blow up the fort's magazines. One magazine held a quantity of the primitive but deadly Congreve rockets. The invasion strategy was sound and the preparations nearly complete two days before the date of attack. But, as so often with the Patriots, their well laid plans began to unravel. Chapter V, "Patriots Invade Canadian Territory," in Northern New York in the Patriot War, 1923, by L. N. Fuller.